When Should I Line or Reline My Chimney? 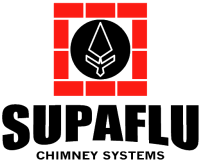 Your current liner could be damaged due to incorrect sizing, lack of cleaning, thermal shock, chimney fire, or just general deterioration from acidic flue gases. Your flue should be visually inspected at least once per year by an equipped and experienced professional. If there is any reason to suspect cracked or damaged liners this should be confirmed by a NFPA inspection of the entire chimney. If your structure was built more than 20 years ago there is a good chance you could improve the safety and efficiency using modern methods. The most common improvements are to fireplaces and furnaces venting through masonry chimneys. When furnace or boiler installations are converted from one fuel to another, relining becomes an important consideration. If you have converted your heating system from oil to gas heat, your chimney could present unknown hazards unless you have had the chimney properly inspected and maintained. After oil to gas conversions the sulphur deposits left from years of oil burning mix with water vapor produced by the new gas appliance. This forms an acid which attacks the bricks and mortar in the chimney. The brick and mortar deterioration can lead to blockages in the venting system that may allow carbon monoxide into the home. This deterioration can occur rapidly and should not the ignored.